I don't think it's a spider..unless it lost two legs..it only has 6. I had one of those flying around in my room a few weeks back. Creepy giant things. Eww, yeah I don't think its a spider so who knows!! Ive seen those too, theyre so gross! Looks kind of like a mosquito, but I have no idea! I think they are call mosquito hawks! They eat regular mosquitos. I love anything that eats mosquitos lol! Yeah, they're mosquito flies! They eat mosquites, my friend calls them skeeter-eaters. I wouldn't want one flying anywhere near my head though! They are the kinds that hang out on the water around lakes and what have you. Is it a daddy long legs? Insects has 3 pairs of legs, wings and 3 "bodies" (hed, middle, back). 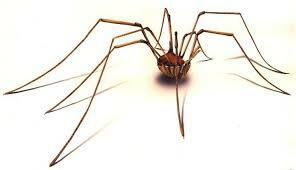 A spider has 4 pairs of legs, no wings and the and only 2 "bodies". It looks like a crane fly to me. Adult crane flies do not eat anything.They are also harmless! It is also a male!